Backpacking in El Salvador will test your senses, and mostly in my case my sense of wonder. I was overaud by it all as gems sparkled left right and centre from a country lacking only in worldwide recognition and self promotion. You might have heard that I toured Santa Ana and Chalchuapa, including a trip to the Indigo Workshop and Casa Blanca. 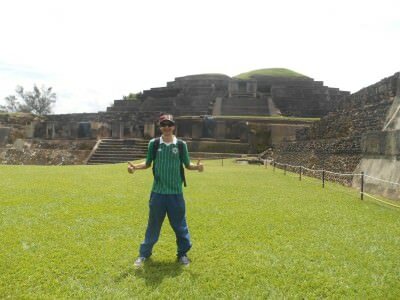 But on my trip to the town, I also did the most touristy thing there, albeit as the only foreign tourist – I visited the ruins of Tazumal. Well worth checking out! 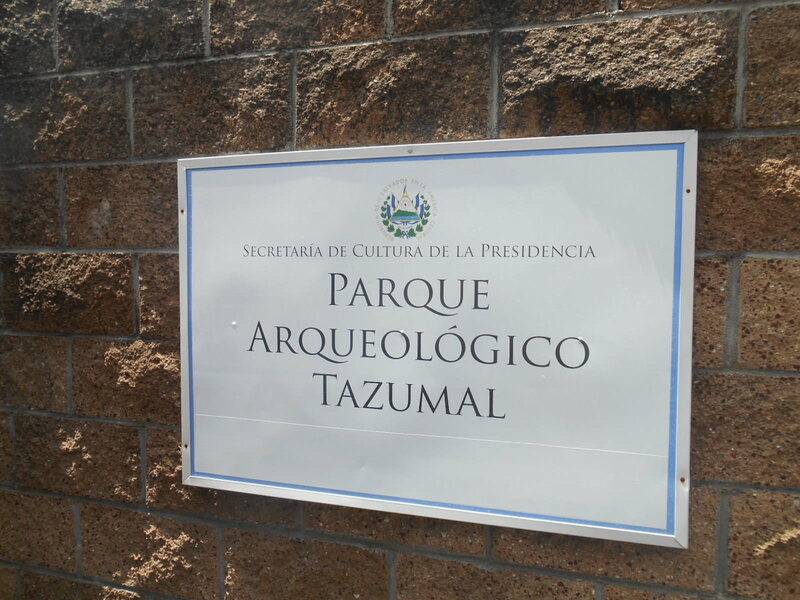 It’s not as hard as you might think to get to Tazumal. Speak a bit of Spanish and you can get by so easily in this country. The locals love it, they are friendly, approachable and helpful. Not once have I met a rude Salvadorian when I’ve approached them in the street for help. Time is of no relevance to them – they will help you. And here’s how I got to Chalchuapa, the town which plays host to the ruins of Tazumal. I was based in Santa Ana for 2 nights at the Hostal Casa Verde (also proudly the best hostel in El Salvador). 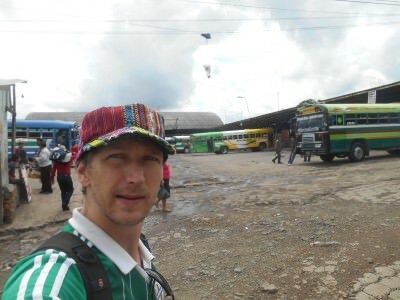 From the hostel, I walked to the main bus station in town, which is near the Mercado Colon and Parque Colon. 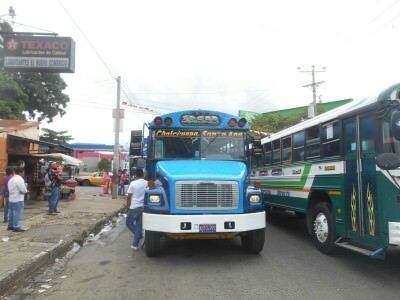 The bus terminal is called Terminale Buses Francisco Lara Pineda. However, the actual bus to Chalchuapa doesn’t actually leave from the terminal itself, but it’s a good landmark to get there by. Head through the bus station until you come to the main Avenida San Antonio. On the corner where it meets 18 Avenida Sur, there are a few yellow taxis. It’s like a taxi stand. On the other side of the street and facing away from the town the Bus number 218 will pull up for a few minutes, wait until it’s full and then head off to Chalchuapa. Bus to Tazumal, well to Chalchuapa. The bus says number 218 on the front as well as Chalchuapa, and if in doubt just ask the driver or the conductor – they will help. Tell them you are heading to Tazumal in Chalchuapa. The bus costs 25 cents and takes around 40 – 45 minutes. 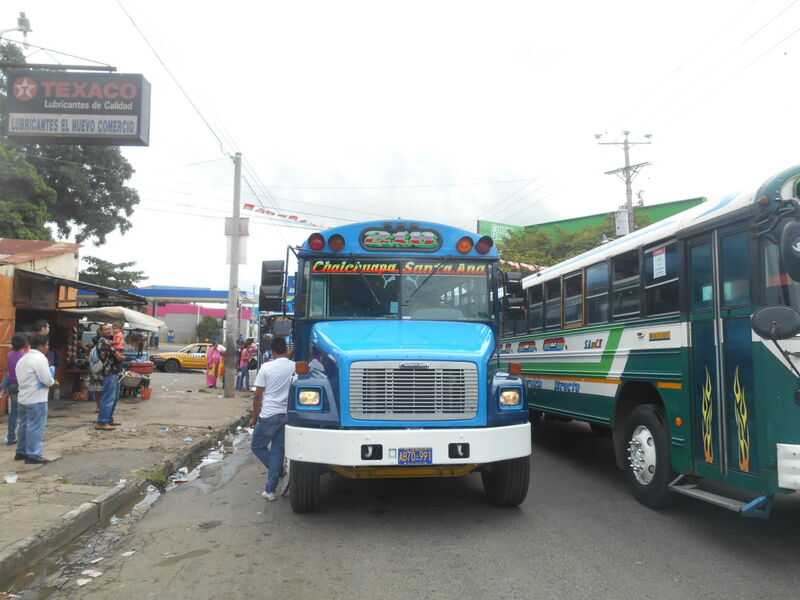 As you reach the town of Chalchuapa, stay on the bus until it gets to the town centre. If you’re told the driver and conductor that you are getting off for Tazumal, they will let you know – Salvadorians are ice cool like that. 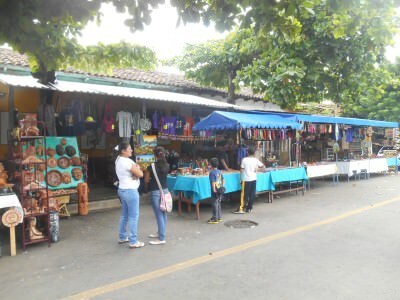 When you get off, you’ll be at a fork/crossroads and facing the way the bus goes, take the left hand street past all the market stalls, souvenir stalls and local restaurants and you can’t miss Tazumal on the right hand side. Any problems – ask the locals, they’re helpful and they’re welcoming. 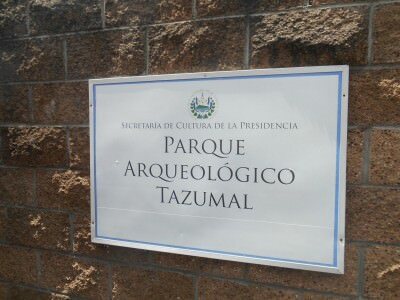 This is the street you walk down when you get off the bus – Tazumal is on the right after 5 minutes walk. Once you arrive at the entrance, you’ll see a kiosk on the left with prices. As a foreigner, you have to pay $3 US to enter and this gives you entry to the ruins and the museum within. Local people only need to pay $1 US incidentally. 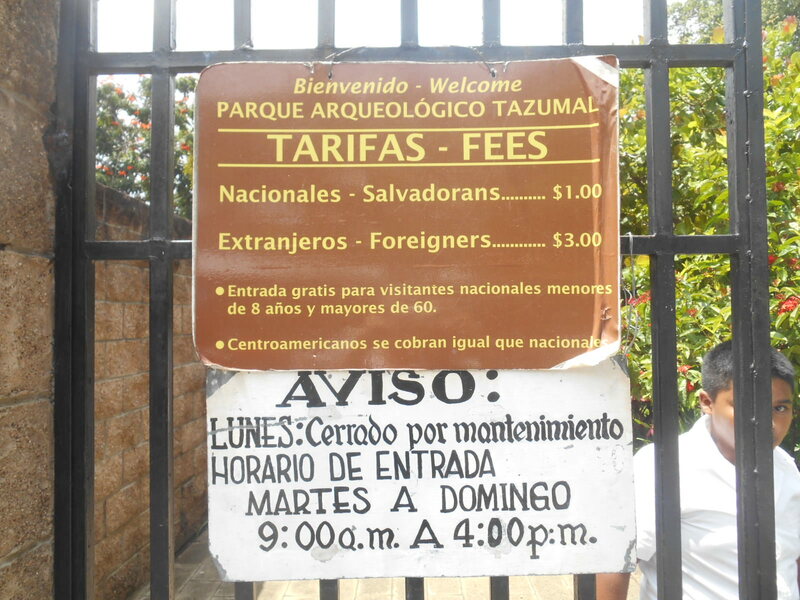 Entrance fees for Tazumal – foreigners are $3 US. Don’t question this – I’m happy to pay and you should be too. For the price, everything you get within is included. 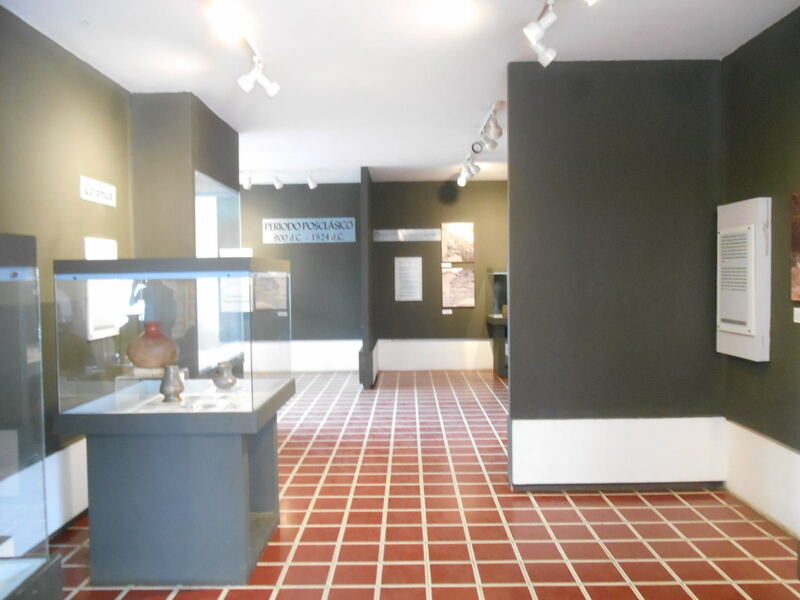 Opening hours are 9am – 5pm Tuesday to Sunday. So try to remember Monday is a no go. Once inside Tazumal, you’re your own boss – no organised tours here (although there might be…) so the deal is you want to tour the ruins, read up on it (plenty of information boards in Spanish and English), take some photos and admire the pyramids. Inside Tazumal – next up to admire and discover the importance of these ruins. 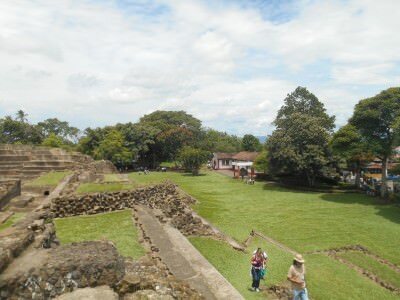 Put simply, Tazumal is the most visited and most impressive Mayan structure in all of El Salvador, despite not being listed on the UNESCO World Heritage list (like Joya de Ceren is – report on that to come). 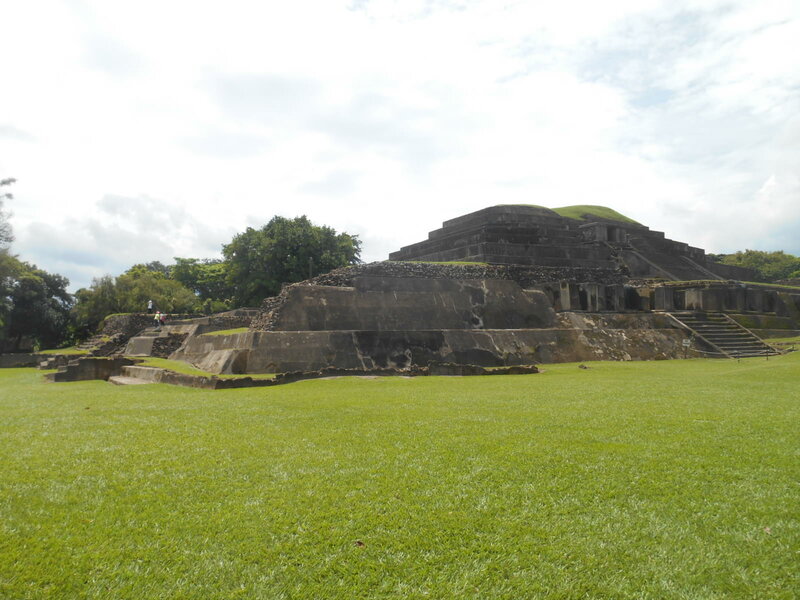 It’s certainly worth seeing and you won’t be the only tourist (as I was at Joya de Ceren). Selfie at the main pyramid at Tazumal but I’m not the only tourist here! 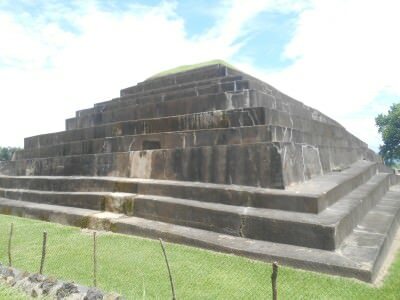 There is a prominent main pyramid and you cannot climb up on this structure apart from the sections not cordoned off. 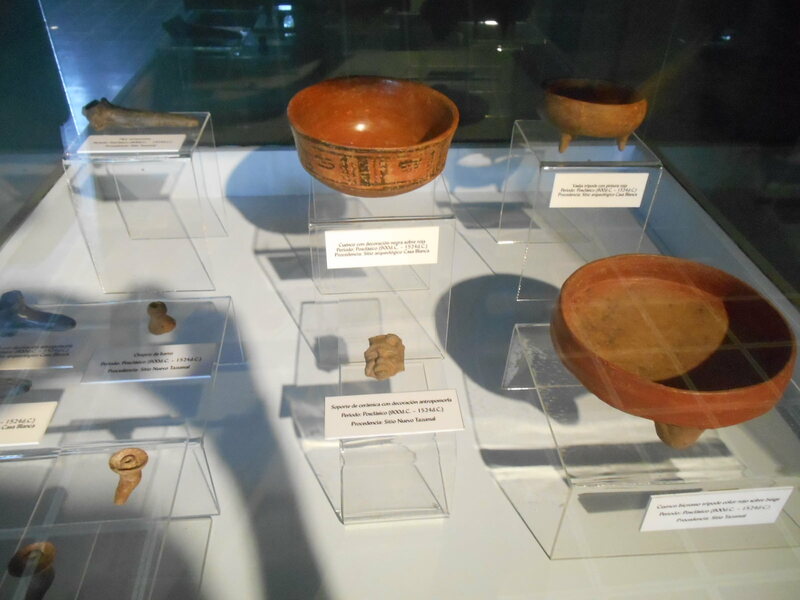 It’s been estimated that people lived here from the year 5000 BC. Pretty crazy thought isn’t it?! 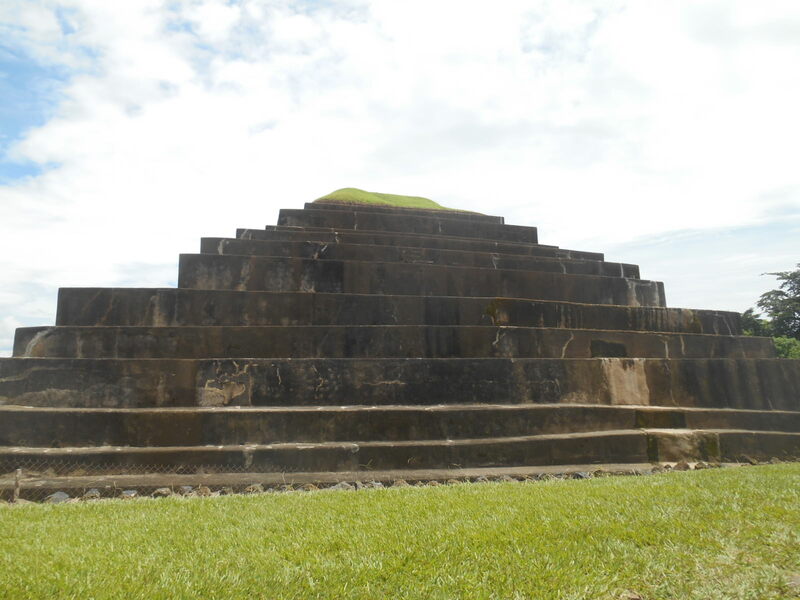 This pyramid dates back to 5000 BC. Crazy. The architectural composition of the main pyramid at Tazumal took the course of six constructive phases. The walls lapsed over one another until they form the complete structure. The first three phases took on the exact same architectural style. The fourth and fifth stage had changes where slopes and pumice stone stucco were found. The sixth and final phase is a construction of cement and stone which is much more recent – 20th century. The pyramid was built in 6 different stages. 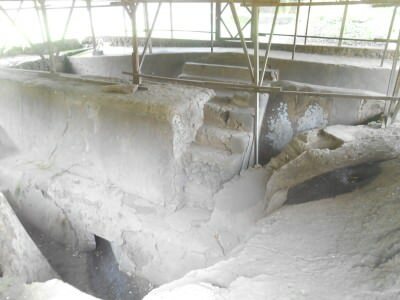 The complex was once covered in cement until archaeologists deconstructed parts of the main pyramid to show the different stages of its design and gain a better awareness of the building’s creation. The excavated part that the archaeologists dug up. Walk around at your leisure. It’s in leafy, grassy grounds and makes a pleasant walk. Doing a full “circle” round it is a good way to see it, on the far side you can see where archaeologists have dug away at the structure to research it. Tazumal is in a green, leafy area and makes a pleasant walk. 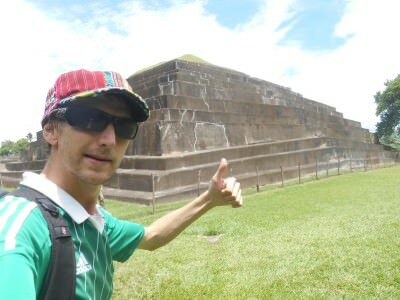 After seeing the pyramid, I headed to the museum (whatever order you want to do it in) – I always like to see the place first without too much information then gather it up after, and research again after leaving. 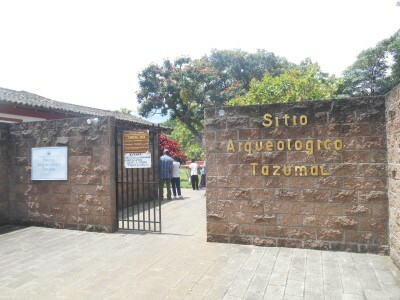 The museum was most interesting for relics and artefacts from the periods of Tazumal’s use. 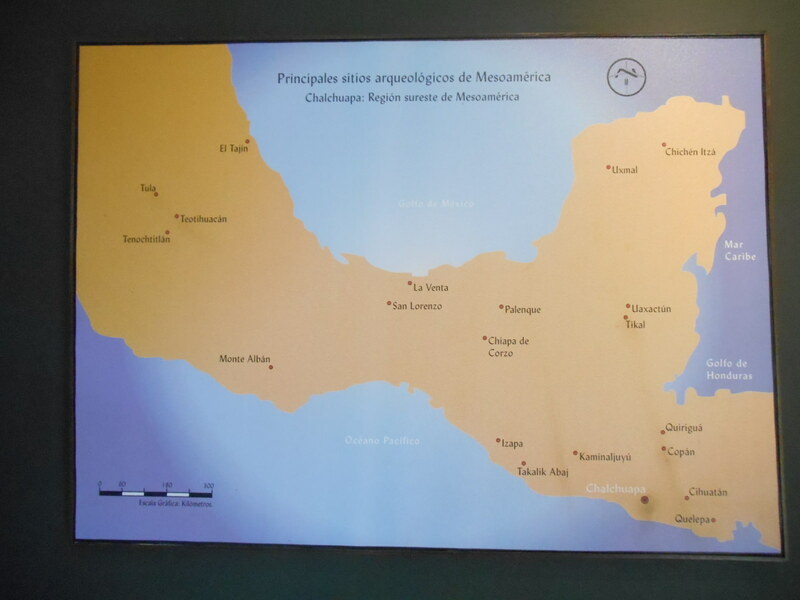 Plus I was interested in how all these Mayan ruins are scattered all over Central America, from Mexico, right through Honduras, Guatemala, Nicaragua etc. and yet they are all connected. 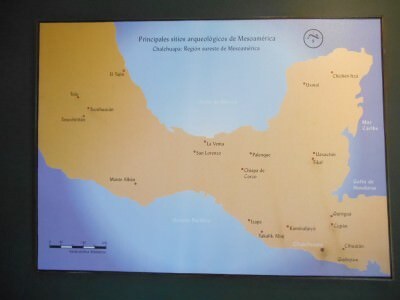 A map showing the main Mayan sites in Mexico and Central America. Souvenir wise, it’s best to buy them outside the grounds in the many stalls. Bargaining is possible, but don’t be too strict on the locals here – they work hard and they don’t deliberately try to con you. 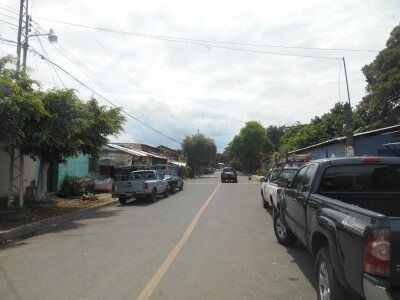 I felt the honesty in the air quite significantly in El Salvador and Tazumal is no different. Souvenir stalls line the streets outside Tazumal. Do I recommend Tazumal??? Absolutely yes!! But please make sure you also check out Casa Blanca, the Indigo Workshop and try the local food in Chalchuapa. It’s doable on a day trip from Santa Ana (as I did) but you can also stay the night in Chalchuapa. 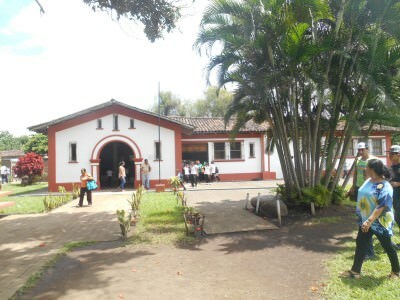 This entry was posted in Chalchuapa, El Salvador, North America, Tazumal. Bookmark the permalink. Hi. Thanks for Sharing this information. Really useful. I AM un San salvador. How can i get to Santa Ana. How much does it cost ? And how long does it take yo get There from San salvador?